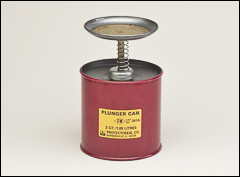 Justrite safety cans Type 1, funnel attachment, plunger can, drip can, oily waste can, drain can. Dip tanks are shown on our Cleaning tanks page. 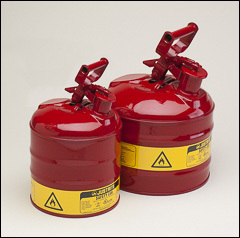 Approved way of dispensing flammable and combustible liquids. Available in four sizes up to five gallons. Designed to carry flammable liquids you’ll be pouring into containers with wider openings. Funnel hose attachment can be used for more accurate pouring in restricted areas. Leakproof, self-venting, self-closing lid controls vapors and spills. Constructed of a terne plate, lead coated steel plate. A tested and approved closure and pressure relief mechanism. Stainless steel flame arrester screen prevents flame from entering can, but doesn't restrict liquid flow into or out of container. Approval listing FM, UL, ULC. 10 year limited warranty. 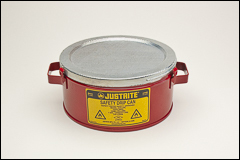 for Justrite Type 1 steel safety cans listed above. Helps when pouring into smaller openings. Large rounded bowl provides protection from splashing and spillage. 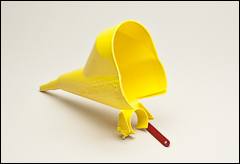 Two position, durable polypropylene funnel attaches easily. The flexible hinge design allows you to fill or pour from can without removing the funnel. When not in use, funnel folds down against the can to take up less storage space. One-hand, single motion depression of the spring-mounted 5" dasher quickly dispenses a measured amount of flammable liquid to a wiping cloth or swab. Excess liquid drains back into the can when dasher is released. The built-in perforated metal flash arrester in dasher cup protects against ignition of can contents. Reduces noxious vapors, and prevents costly evaporation losses. Catches and safely retains any spillage when can placed under drum faucet. Perforated metal flash arrester prevents any flashback from the igniting can’s contents. FM approved can is 4 1/2" high with a 9 3/8" outside diameter. Provides for a safe, temporary disposal of flammable soaked rags or wiping materials. Guards against spontaneous combustion. Cans open to a full 60° with a slight pressure on foot treadle. Cover closes automatically when foot is removed. Features ventilating air holes in raised bottom. FM approved. 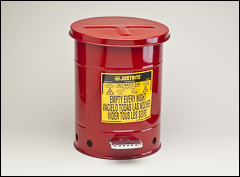 Extra large, 8 7/8" opening on funnel-type top section provides for fast, splash free receiving when you drain flammable or hazardous waste liquids from other containers. 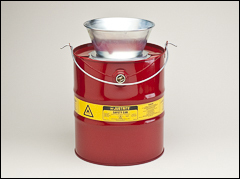 A metal flash arrester protects against ignition of contents. Heavy-duty pail handle provides for easy carrying, and a 3/4" threaded plug allows for safe disposal of fluids from it. FM approved.